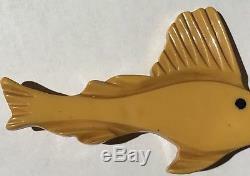 This chunky vintage butterscotch Bakelite carved swordfish pin has a black painted eye. Measures approximately 3-3/4"in length by 1-3/4" from top of fin to bottom of bottom fin. Has a drilled in secure closing roll over style pin back. You can't see it in the photo, but there is a very small indent about 3/4 down the body, closer to the tail. Tests positive for Bakelite with Simichrome. The item "VINTAGE BUTTERSCOTCH CARVED BAKELITE SWORDFISH FISH PIN BROOCH" is in sale since Monday, March 26, 2018. This item is in the category "Jewelry & Watches\Vintage & Antique Jewelry\Costume\Bakelite, Vintage Plastics\Pins, Brooches".